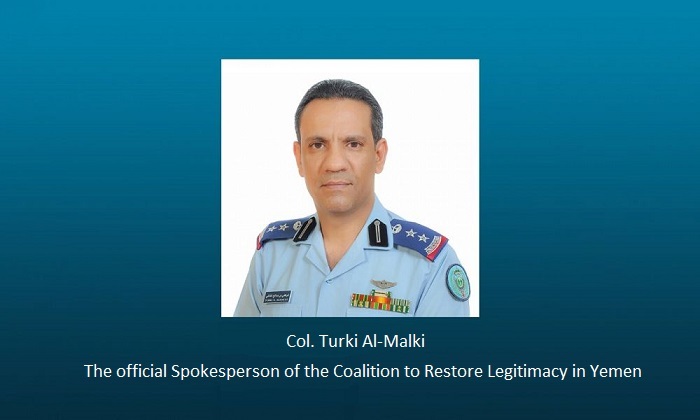 The official spokesperson of the Coalition “Coalition to Restore Legitimacy in Yemen” Col. Turki Al-Malki cast light on the comprehensive humanitarian operations in Yemen, the position of the Restoration of Hope in Support of Legitimacy in Yemen, the Houthi interventions and threats to the regional and international security, the targeting of Houthi capabilities inside Yemen and the Yemeni national army support operations. In the periodical weekly press conference of the Joint Forces Command of the Coalition, held here today, Col. Al-Malki valued the recent achievements, citing the inspection tour by the Yemeni Minister of Information of the liberated areas accompanied by a media delegation in addition to a number of bodies from a number of provinces, including Hijja, Sa'ada, Sana'a and Al-Baida provinces. He cited the statement issued by the International Committee for Red Cross in which it said that the workers in the relief field have faced life-threatening hostile acts. The Coalition condemns such threats posed by Houthi militias, underscores the importance of enforcing the humanitarian and international law as regards the protection of relief personnel and workers in embattled zones, he said, adding that "we are continuously working with the International Committee for Red Cross to provide the best environment and circumstances for the work of UN organization". Col. Al-Malki added that " No doubt the popular mood throughout Yemen goes against the Houthi militias' behaviors and hostile acts in all governorates". He went on to say that, concerning the humanitarian operations, all 22 air, sea and land relief inlets are still working at their full capacity to allow the entry of the necessary items as well as the relief items of the UN and other international organizations. "As you might notice, as many as 25472 air, sea and land permits and 10688 non-targeting orders have so far been issued reflecting the keenness of the Coalition to remain committed to the protection of personnel and relief caravans inside Yemen, contrary to the Houthi militias acts which threaten the lives of relief personnel and workers in Yemen", Al-Malki said, adding that all Yemeni sea ports are working at their full capacity. Col. Al-Malki said the assistance provided by King Salman Center for Humanitarian Assistance and Relief Aid as part of the comprehensive humanitarian operations in Yemen have until this evening benefited 4,791,792 Yemeni citizens. He explained that the Houthi militias have systematically attempting to smuggle money and forged passports into Yemen. In this regard, he said as much as 5,750,000,000 Yemeni Riyals equivalent to more than $22 million as well as 5297 counterfeited passports were confiscated as they were being sent to the Houthi militias in Sa'ada. The passports are used to enable Houthi leaders and their families to travel outside Yemen while the smuggled money is used to dump the local market with valueless money, pay the salaries of newly-recruited enlists, including children and other fighters, and create a black market to assist what they call the "military campaign", the spokesperson said. Al-Malki said the Houthi violations are still going on in the province of Saada, the platform of ballistic missiles and the destination of smuggled missiles from outside Yemen. During the period, there were four ballistic missiles heading towards the Kingdom of Saudi Arabia, with one falling inside the Yemeni territories, he said. He said the progress achieved by the Yemeni national army supported by the Coalition is continuing during the period to achieve great successes on the ground and at all fronts of the battle. The official spokesperson of the Arab Coalition to Restore Legitimacy in Yemen, said the number of ballistic missiles and projectiles launched on the Kingdom amounted to 149 missiles and 66315 projectiles.